Raaj Sagar Steels is ISO and NORSOK Approved Manufacturers & Suppliers of Inconel Fasteners such as Inconel Set Screws, Inconel Washers, Inconel Hex Bolts and Nuts & Inconel Stud Bolts.The main reason being we have an excellent warehousing and storage facilities for both finished and semi finished goods. In 2015 we have stocked more than 177 Tons of Inconel Fasteners in all sizes, to cater to immediate delivery and urgent needs of the clients. For small Requirements we can dispatch the Fasteners immediately against the purchase order.We stock a wide range of Steel fasteners materials and grades, high strength and exotic alloys, tested to meet SAE, ASTM, ASME, and ISO standards. 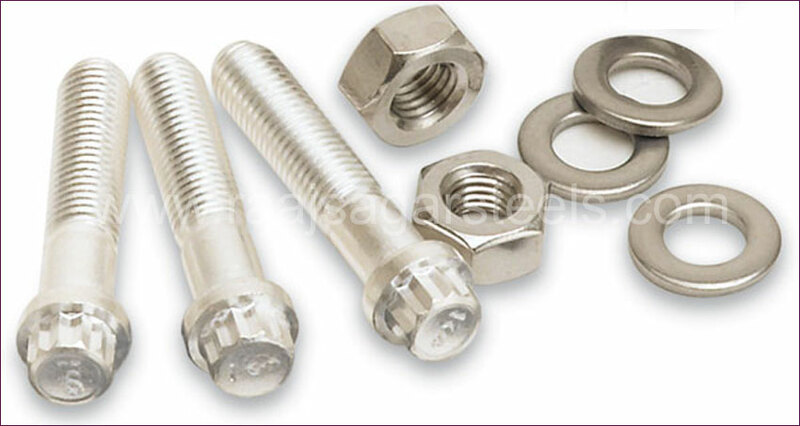 Inconel 600 Fasteners, Inconel 601 Fasteners, Inconel 625 Fasteners, Inconel 718 Fasteners, Inconel X750 Fasteners, Incoloy 800H Fasteners, Incoloy 825 Fasteners, Bolts And Nuts, Stud Bolts, Hex Nuts, Double Ended Stud, Square Bolts, Lock Nut, Pan Head Screw, Set Screws, Flat Head Screws, Cap Screws, Washers, Belleville Washers, Spring Washers, Foundation Bolts, Tie Bar, Punched Washer, Coupler Nuts, Locking Nuts Etc.